Life can be hard on teeth, but a mouthguard protects them. Mouthguards are used for two main reasons — to protect the teeth from outside forces (such as sports injuries) and inside forces (teeth grinding or bruxism, and TMJ). The American Dental Association recommends wearing a mouthguard for more than twenty-five different sports and activities. Playing these sports without a mouthguard means you double the chance of injuring or losing a tooth, or damaging the soft tissues inside your mouth. There are “boil and bite” options at your local drugstore or sporting goods center, but the better your mouthguard fits and feels in your mouth, the more likely you are to wear it and the better it gets the job done. Your mouth is unique, so a “one size fits all” device is not the best choice for long-term use. A custom-made mouthguard from the Placerville Dental Group uses an exact impression of your teeth, ensuring a comfortable and perfect fit. Made from durable resin materials, your mouthguard is comfortable, protective and long-lasting. While you want to play like the pros, keeping all your teeth is a good thing too. Bruxism is the official term for grinding your teeth. Many people are completely unaware they grind their teeth at night, until they are told by an aggravated sleep partner or family member. Grinding your teeth not only annoys those who can hear it, it causes tension in your jaw that can last all day, and it is very damaging to your teeth. It is possible to wear down your tooth surfaces or to even crack your own teeth by the intense pressure from this nighttime habit. 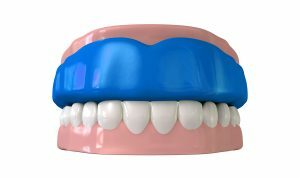 If your Placerville dentist (or family member) informs you that you grind your teeth, don’t delay in getting a custom-fit mouthguard or “nightguard” from the Placerville Dental Group. It is designed just for you, fits perfectly into your mouth and conforms to your bite. Once you begin to wear a mouthguard and experience a night of sleep with no jaw clenching, you’ll wonder how you ever got by without one! Your family members will rejoice and take out their earplugs — even the dog will get a better night’s sleep. Best of all, warding off serious dental problems with a custom mouthguard is an investment in your future dental health.